Gardens are very pretty, but sometimes you need to just give the overall landscape a little depth by added a structure here and there to make the place really stand out. 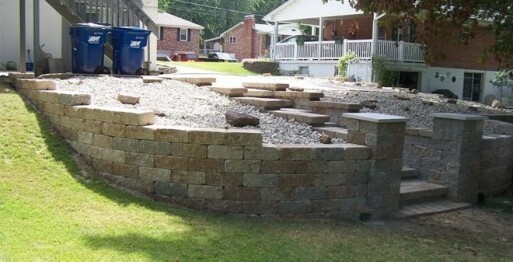 Building a garden wall is a great way to do that and make your property not look quite as flat as it is. In addition to that, this can also be a great way to keep those predators out of your produce or at least make it harder for them to get to. While it is easy to hire someone to get the job done it is also possible to just take care of it yourself, as you will find that it is not that complicated of a process. 1. The first step you will need to do is to make sure you have plenty of time. This will not likely be able to get done in a day or a week, so plan it out accordingly in order to prevent yourself from getting frustrated during the building process. 2. Next, you are going to want to dig a trench about at least a foot deep and as long as you will want your garden wall to be. Use a shovel to remove the soil and then take a few stakes and drive them into the ground about 3 to 6 feet apart from each other, depending on what length you picked. This will help the area stay solid as a base for when you add the concrete. 3. After you make sure your trench and stakes are level, pour in the concrete to fill up the trench and smooth it out with an edger. You could also use a metal floater to smooth out the wet concrete, but just make sure you do that before you leave it to dry. It will have to sit still for a few days to ensure that it is dry before you can start building your wall. 4. Then, take the bricks you will be using for the wall and do a dry-lay of them to see how it will work. If needed you may have to cut a couple of them in half to ensure that they will fit properly. Once you have the first set of bricks figured out, mix up some mortar and lay it on top of your concrete base. You will want it to be at least a ½ inch deep so your bricks will have some room to get really snug. As you place the brick on the mortar, use some force to lay them down and check that it is even with a level tool. 5. Once you have the first layer of bricks down, repeat the process for the following layers. If you want to do an alternating pattern or a rising pattern, you will have to keep a ruler on hand to make sure it is all in the right place. In addition to that, you will have to keep that mortar handy to fill in the sides. Be sure to leave enough room between the bricks to apply a layer of filler so that the whole thing is held together very solidly. 6. Now you should have a very nice, neat looking garden wall. To finish it off take a small filling tool and add extra mortar to where it looks like it is lacking. You can also add other finishing touches like a paint layer or glaze, but many people just prefer to have the natural brick looking wall. Either way it will be a beautiful addition to any garden, and it is amazing what you can do simply with some concrete and bricks.